Same as normal reservations policies. Min stays of special dates should be respected by groups as well. El Misti Ipanema is just 3 minutes' walk away from Ipanema Beach. Copacabana Beach is a 10-minute walk away. In addition, it is located just 1 minute walk away from the Nossa Senhora de Paz metro station. 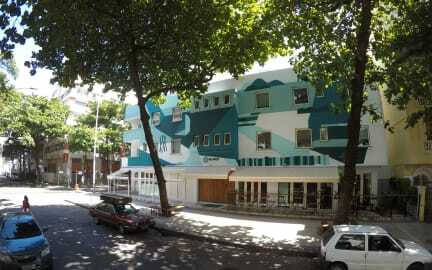 It is the most recent unit of the El Misti Hostels, designed to match the high level of the Ipanema neighborhood. The Misti Ipanema was designed to meet all the needs of travelers while maintaining a hostel atmosphere. El Misti Ipanema has mixed dormitories for 4, 6, 8 and 12 people with private bathrooms. All equipped with air conditioning, individual wardrobes and bedding. It also has private double, twin, triple and quadruple rooms with private bathrooms. All equipped with air conditioning and bedding. The Ipanema neighborhood is one of the most famous in the country and worldwide. It has a heritage of artists inspired by its beauty and its bohemian vibe. Today is the peak of tourism in Rio. People from all over the world come to visit their traditional bars, listen to live music and watch their postcard sunset. El Misti Ipanema is located at number 9, the young point of the neighborhood and an unbeatable location. A relaxed atmosphere and a 24-hour multi-lingual staff willing to give you some advice on excursions and tours, is what you will find in this hostel. Here you can meet other travelers like you and have an unforgettable stay! I don’t know if you can find a better hostel in Rio! It was the best place to stay and I wished a stayed more. Only complaint is for my room, just cause of noises of some machines, maybe AC, coming from outside. Staff is great, like really so friendly, ready to help and also to have a chat! All of them. Breakfast was ok, just too poor. Little portions, I thought it was not worth it since supermarket is a block away. It’s great they have tours just many weren’t available! Go to the parties! Buona posizione, nell hostel mi è stato offerto il tour per Ilha Grande e Cabo Frio. ti porteranno lì, pagherai lì, ti lasceranno di nuovo in ostello! super consiglio Ilha Grande !!! Amazon Staff, fantastic Place, I can only recommend! Assolutamente consigliato! A cento metri dalla spiaggia di Ipanema. Ragazzi della reception sempre disponibili per scherzare e dare consigli! Ottima pulizia e doccia grande! Tornerò sicuramente.